A lot of people still aren’t convinced gaming phones are something that should even exist. 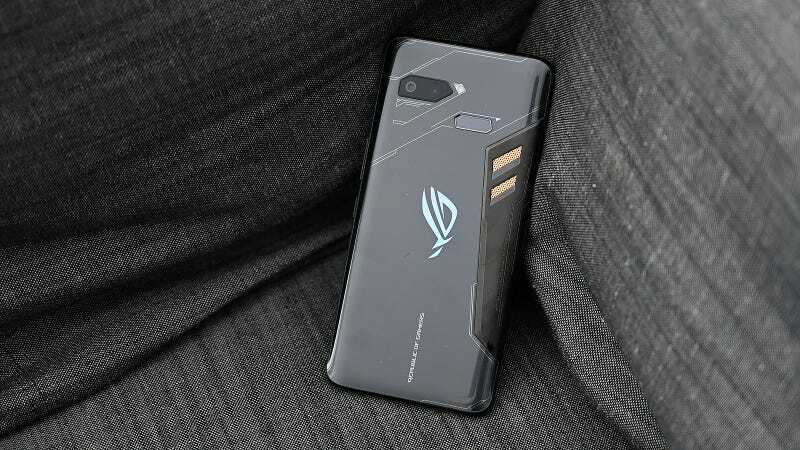 But if there was one phone that might be able to sway peoples’ opinions, it’d be Asus’ Republic of Gamer (or ROG) Phone. 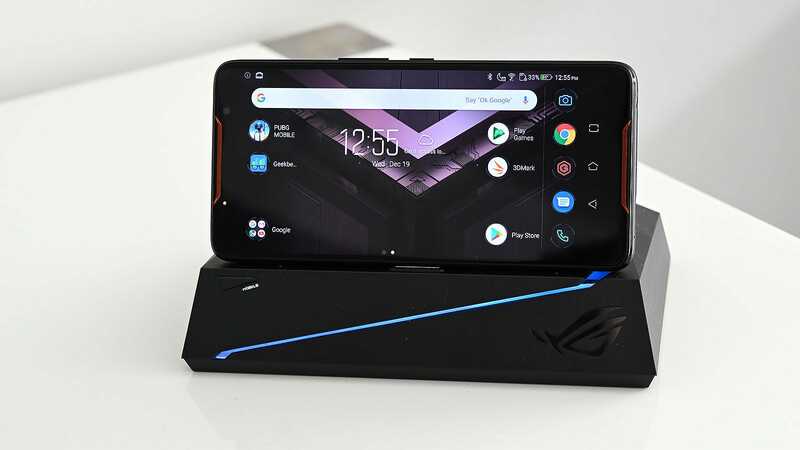 In fact, based on some recent corporate shuffling, Asus is so emboldened by the ROG phone that the company is shifting its mobile strategy to focus even more on mobile gaming and high-end users. That’s an ambitious bet, but after playing around with ROG Phone, I have to admit there is a little sparkle to this mobile battle bus. But behind its aggressive facade, there’s actually a lot to like about the ROG Phone’s chassis. Down below, there’s a USB 3.1 Type-C port and a 3.5mm jack, but if you look around to the side, there’s a tiny silicone plug that hides two more USB-C ports. Actually, it’s more like one and a half USB-C ports, because if you look closely, you’ll see that one of the ports is coloured orange. That’s your warning that it’s not meant to be used as normal, but only in tandem with Asus’ assortment of ROG Phone accessories (more on those later). However, that still leaves a second full USB-C at your disposal, which is something I wouldn’t mind seeing on more phones in general. 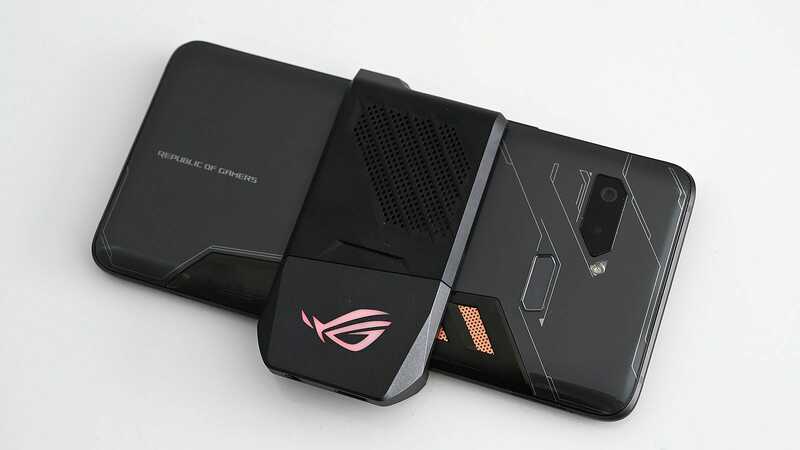 That little alien-like chevron symbol etched into the side of the phone is one of the ROG Phone’s AirTriggers. 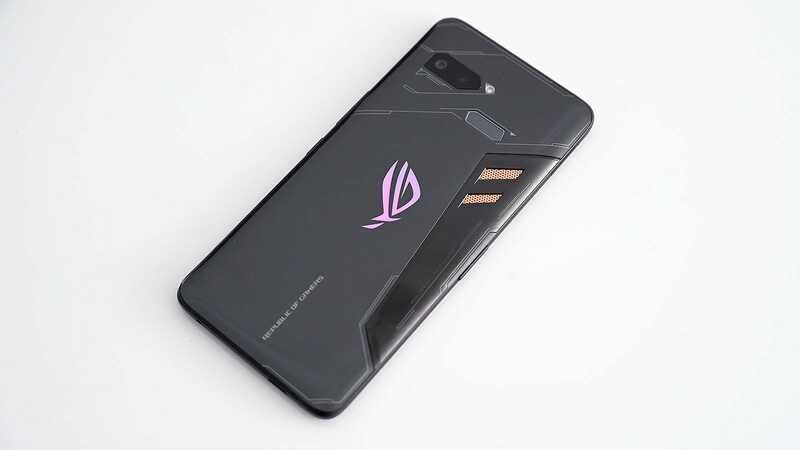 And if you look even closer at the ROG Phone’s sides, you’ll see three small symbols (two on the right and one on the left) that are actually touch-sensitive buttons that be customised for gaming. 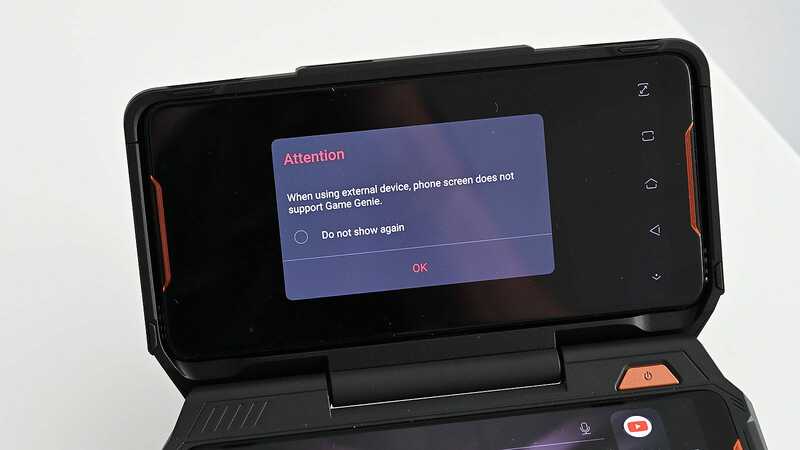 The way it works is that by going into the phone’s Game Genie settings (yes, that’s really what it’s called), you can drag little circles over a mobile game’s traditional on-screen controls and set them so that can be triggered by the ROG Phone’s touch-sensitive AirTriggers. 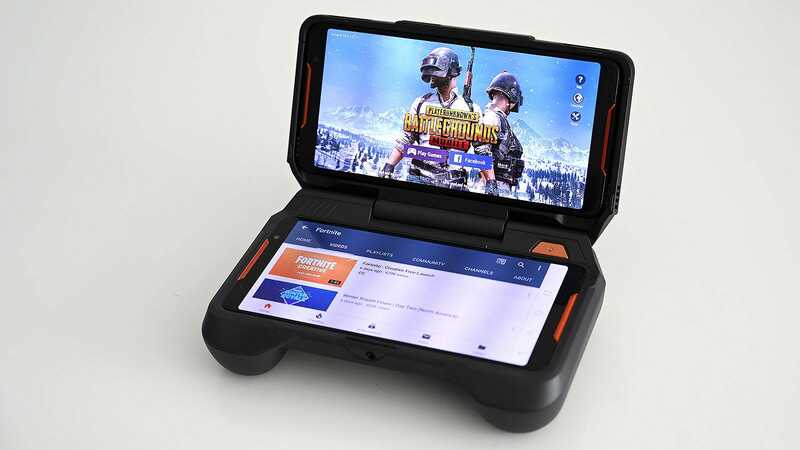 While it’s not a perfect fix for on-screen buttons, it does instantly give you a better way to play titles like Fortnite or PUBG Mobile. 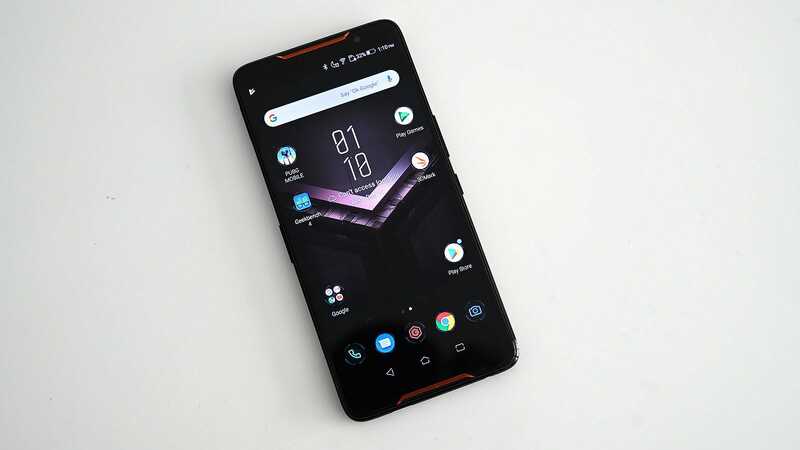 Meanwhile, the ROG Phone’s UI sports a heavily themed look that apes its exterior design, with the Game Center app serving as your portal to control things like the phone’s rear RGB light, various game profiles, performance mode (Asus calls it X Mode), and more. You can even see the phone’s memory usage and the clock speed of your CPU and GPU, which might normally seem out of place on a mobile device. But on the ROG Phone, it makes perfect sense, because if you want speed, the ROG Phone has got it. Featuring a Qualcomm Snapdragon 845 chip (which Asus claims was specially selected to deliver optimal performance), 8GB of RAM, and 128GB of storage (or 512GB if you upgrade), the ROG Phone is a mobile powerhouse. On Geekbench 4 and 3DMark, it delivered five to ten per cent higher numbers on benchmarks compared to other flagship phones, and easily matched the kind of performance we saw from the Razer Phone 2. And while the ROG Phone’s vibrant six-inch AMOLED display doesn’t offer the same 120Hz refresh rate found on Razer’s competitor, its colour pops more than the Razer’s LCD display, and Asus’ 90Hz screen (which is actually the refresh rate the Razer Phone 2 is set to out of the box) still makes games look a tiny bit smoother than normal. What might be even better than the ROG Phone’s horsepower is its battery life. Thanks to a big 4,000 mAh battery, the ROG Phone lasted 12 hours and 57 minutes our on rundown test, which puts it in the same range as the iPhone XS Max (13:07) and only about an hour behind the Galaxy Note 9 (14:11). So how about those accessories? Well, they are plentiful and quite varied, and are one of the ROG Phone’s main advantages over the Razer Phone 2. Included in the box, the ROG Phone comes with a nifty little fan add-on that attaches to the phone’s side-mounted USB-C port. Sadly, its ability to keep the phone cool is kind of hit or miss, but even when it isn’t properly moving air around, it also features a pass-through USB port and an extra headphone jack. This means when you’re holding the phone in landscape mode – as you often do while gaming – the sides of the phone are clear of cords and cables. Here’s the fan add-on, it connects to the dual USB ports on the phone’s side and then snaps into place. Once attached, it does it best to help keep the phone cool, and also offers an extra set of ports to help prevent cables from messing with your grip. Asus’ Mobile Desktop Desk turns the ROG Phone into a second screen of sorts, and lets you hook up extra peripherals like a monitor, mouse, and keyboard. This is kind of a ridiculous amount of ports for a phone, but I’m not complaining. The TwinView Dock turns the ROG Phone into a Nintendo DS wannabe, but it lacks the kind of support and compatibility that would really make it interesting. Sadly, the TwinView Dock’ screen can’t be used as a dedicated controller in all but a handful of games. 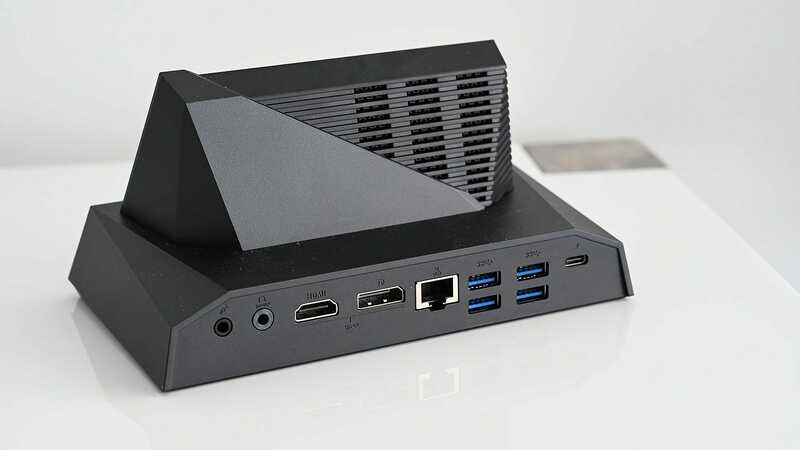 My favourite ROG Phone Accessory is probably the Mobile Desktop Dock. It retails for $230 in the US, but there's no UK price announced just yet. Not only does it prop the phone up for use as a mini display, it also includes a tonne of ports so you can hook the ROG Phone up to a mouse, keyboard, and an external monitor so you can game in style and with enhanced precision. Ain’t no one going to out-snipe you again. And if the price feels a little steep, there’s also a smaller Pro Dock that has a few less ports but does essentially the same thing. However, the one accessory that didn’t quite live up to expectations is Asus’ batshit £280 TwinView Dock. 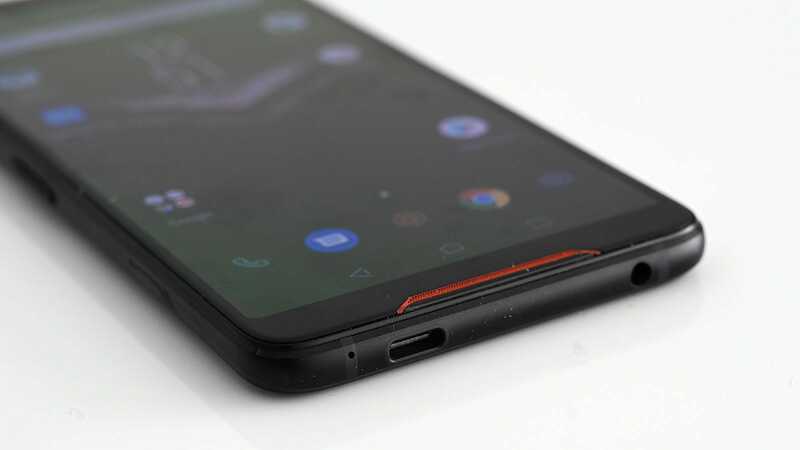 From the outside, it sort of looks like a controller add-on, but when you open it up, there’s actually a second six-inch screen that connects to the ROG Phone. 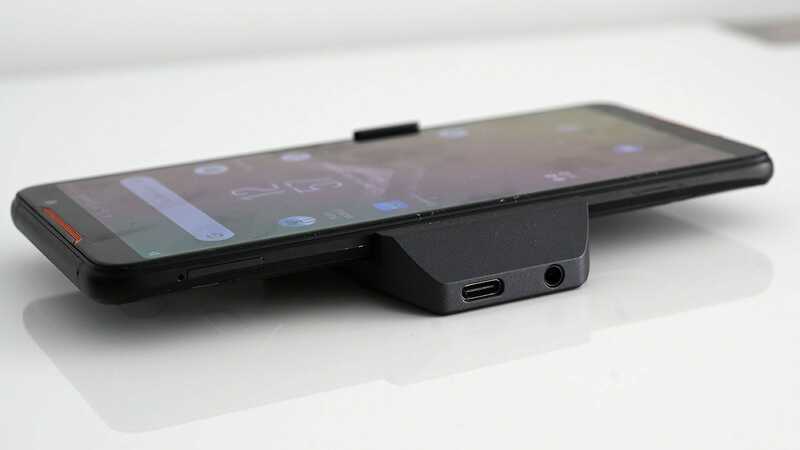 Sadly, even though it looks like it should, the TwinView Dock doesn’t turn the ROG Phone into a futuristic Nintendo DS, since almost no apps can actually use the second screen in a meaningful way. I was hoping that in games like PUBG, you’d be able to use the lower screen as a control pad, leaving the top display clear for playing the actual game. But aside from a handful of titles, that’s not really possible. Basically, that means the best you can do is put two different games or videos on each screen, which sounds better in theory than it functions in real life. And because multitasking on Android is still somewhat limited, when you go to play one game, the other gets suspended. So you can’t even really play two games at the same time, no matter how hard you try. As a regular phone, one bright spot of Asus’ gaming handset is that, thanks to the company’s experience making handsets, the ROG Phone is actually a pretty decent picture taker. In the front, there’s am 8MP selfie cam, while the back offers a 12MP main camera with a 8MP secondary shooter for snapping wide-angle pics. Compared to the Razer Phone 2, the ROG Phone generally captures slightly more detailed and vibrant photos. And in the one shot of some noodles where the ROG Phone’s came out slightly underexposed, Asus’ gaming phone suffered from way less noise and captured things like the texture on the bowl and garnishes more accurately. For a phone targeted at gamers, it would have been so easy to cut corners on the ROG Phone’s camera quality. 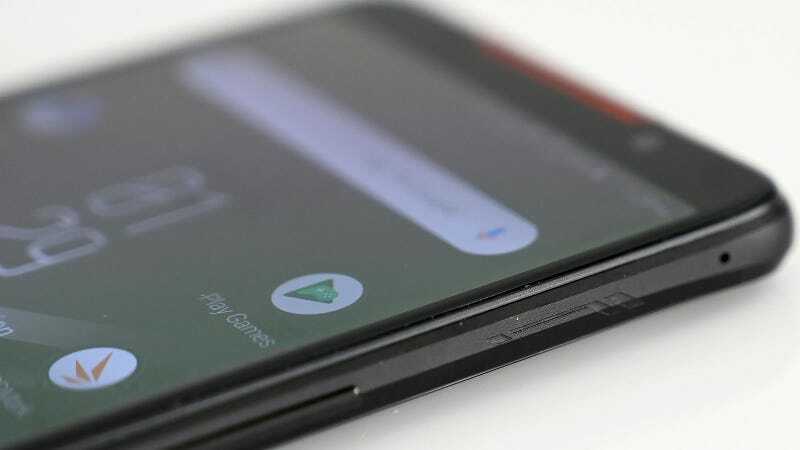 But Asus didn’t; while still not quite on the level of a Pixel 3 or Galaxy S9, it turns out that the ROG Phone ain’t half bad. Not only did the ROG Phone cut down on the slight greenish tint seen in the Razer Phone’s 2 pic, it also offers much more lively and saturated colours. The ROG Phone’s big advantage here was its ability to capture better details on things like the little blemish on the pepper in front. While some folk might gravitate towards the Razer Phone 2's pic because it’s brighter, the ROG Phone captured the better overall photo. It just needs a slightly tweak on its exposure. This comparison was the closest of the bunch. The Razer Phone 2's pic is overly green again, but the ROG Phone did blow out more of the lights on the tree. In the end, the most divisive thing about the ROG Phone is its £800 starting price. That’s not to say that Asus’ gaming phone doesn’t have the specs or features to back that up – it does. Well, at least as much as any phone that costs the best part of £1,000 can. But anything this niche and this expensive is always going to be a tough sell. But when compared to the Razer Phone 2, the ROG Phone is better in almost every way. It’s got superior cameras, longer battery life, and nifty AirTriggers, and its collection of admittedly pricey accessories allow you to flex your mobile gaming muscle in a way Razer’s competitor doesn’t. And with outrageous styling and RGB lighting, the ROG Phone is unapologetic embrace of "gamer life", for better or worse. The ROG Phone’s performance is as good as it gets for a Snapdragon 845-powered device, and its battery life is pretty solid too. For a gaming phone, the ROG Phone’s cameras are better than expected. Asus’ gamer aesthetic is so aggressive it’s almost endearing. Starting at £799, this thing ain’t cheap, especially if you are thinking about tacking on some of Asus’ pricey ROG Phone accessories.